Reduce waiting time with SNAP fast-fold poker! 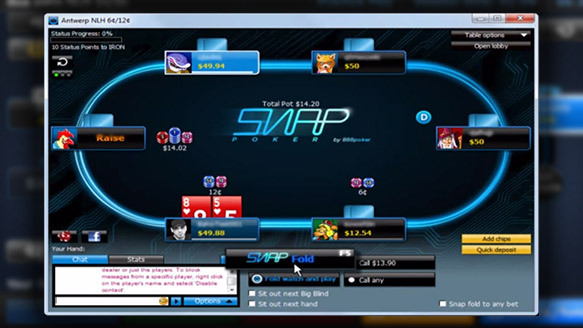 SNAP Poker is the fast-fold poker format from 888poker, designed to reduce waiting time as you’re dealt new cards the instant you fold! 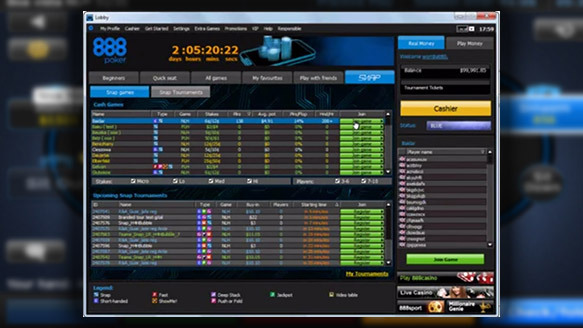 It’s faster and better than any other online poker software and can be played both in Cash game and Tournament formats. SNAP is also available on Mobile, so you can play the game you love whenever, wherever! When playing SNAP poker, you’re automatically placed in a ‘Players Pool’ and randomly re-seated at a different table every time you fold. 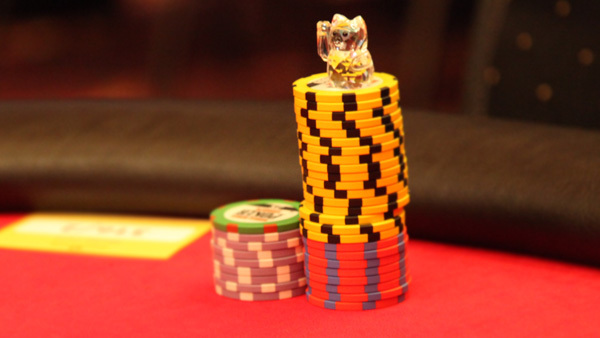 SNAP lets you ‘SNAP Fold’ before the action gets to you (out of turn) and within seconds, you’ll be dealt a new hand at new table with new opponents. However, other players on the table will not see that you folded until it is your turn to act. You may opt to fold or ‘SNAP fold’ and continue watching the hand play out, by either clicking on the Fold watch and play button or by holding down the Shift key whilst clicking on ‘fold’ or ‘SNAP fold’. By choosing to ‘Fold watch and play’, a new screen will appear. In this screen you can watch the rest of the hand in ‘observer mode.’ In the original screen you’ll be moved to a new table, so you can continue to play. Please note that it’s only possible to observe one hand at a time. The “Fold watch and play” option is enabled for SNAP ring games only. 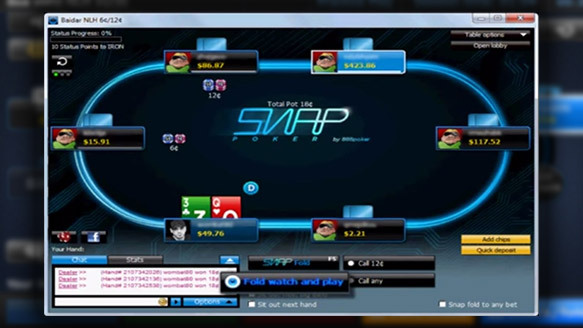 You’ll see the SNAP tab on the right side of the screen when you enter the 888poker Main Lobby. Click on it or drag it to the left and you will be transferred to the SNAP Main Lobby. Under the SNAP tab, you’ll find two sub tabs, with ‘Cash’ or ‘Tournament’ play options. 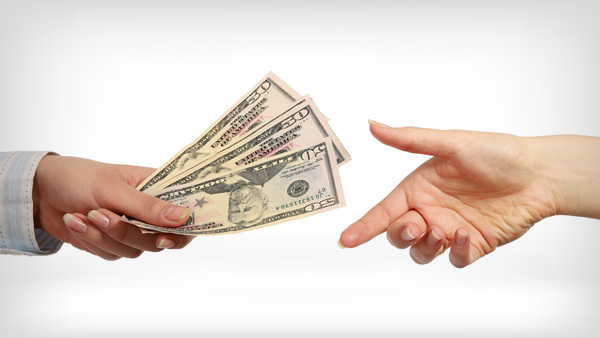 If you want to buy-in to a SNAP Cash game, start by clicking on ‘Cash Games’. Then just double click on a specific pool name, highlight and click on the ‘Join Game’ button. 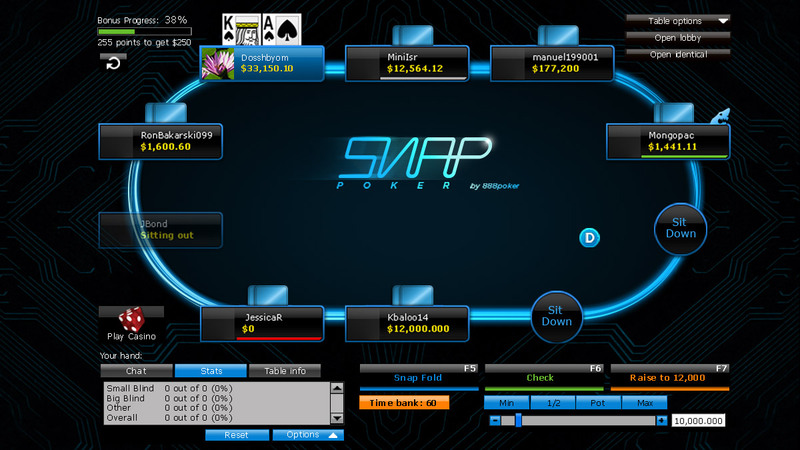 Click on ‘SNAP Tournaments’ to see a list of SNAP Tournaments that are open for registration, including SNAP Sit & Go games. Simply choose one, buy-in and start playing! 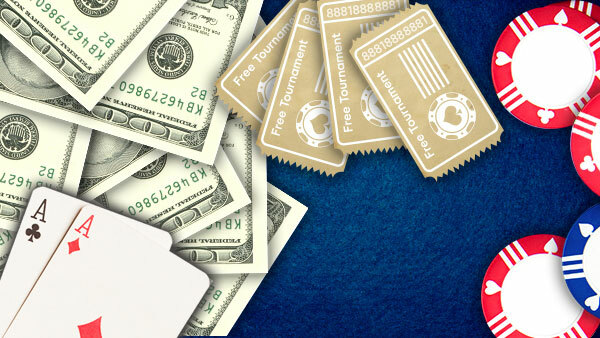 You can also find a list of SNAP Tournaments including Sit&Gos under the ‘All games’ tab in the 888poker Main Lobby.